When you're hard at work in the shop, the last thing you need is for your equipment to fail. That's why the BendPak TRI-MAX™ LS7580V-601 7-1/2 Hp Air Compressor is built as rugged as they come. Get pressure perfection every time with BendPak's leading-edge compressor technology. Designed to operate at maximum efficiency under all load conditions, this BendPak compressor features durable cast iron construction for both extended life and reduced downtime. Never settle for less. When you choose a BendPak TRI-MAX™, you're getting the most technologically advanced air-compression technology available, backed by the world's true automotive equipment leader. Among those who know, our TRI-MAX™ series air compressors have earned a solid reputation for meeting the rigorous demands of everyday business in auto body shops and manufacturing plants. In particular, the BendPak LS7580V-601 is an ASME-certified power-house that features the renowned TRI-MAX™ extreme-duty 3-cylinder pump, designed and manufactured to operate with maximum efficiency under all load conditions. This 100% cast-iron pump has a "W-3" configuration that provides 360° cooling efficiency and splash lubrication ensures total reliability. It features a larger pump that makes little noise, but packs a lot of power. Ever notice how your old compressor radiates a whole lot of heat after it's been running? All that heat can only mean one thing—wasted energy that could have been used to maximize your CFM. That's why we crafted our TRI-MAX™ compressors to operate on the "run slow; run cold" principle. It's simple: slower speeds combined with larger pistons result in much lower operating temperatures. So you know that you're getting the most out of your TRI-MAX™ compressor. Think of a large wheel versus a small wheel. With the larger wheel, you get where you're going in fewer rotations. The same holds true for the TRI-MAX™. Move more air with less work! To top it off, an integrated pressure unloader valve is employed to exhaust the air between the compressor and the check valve, allowing the compressor to begin its next cycle without any head pressure. Longer life, less downtime, heavy-duty reed valves, finned copper tubing for superior tubing and more horsepower—the LS580V-501 is everything you want in an air compressor. Baldor™ motors BendPak offers you the peace of mind that comes with buying the best. Our TRI-MAX™ series air compressors feature the best electric motors on the market. For the past 80 years, Baldor Electric has led the industry in developing electric motors that deliver fantastic performance and reliability, all while burning through less electricity. High performance and reliability are the hallmarks of these highly efficient motors. Premium-grade copper wire, more iron, thinner laminations, high-grade steel, superior bearings, larger end rings and low-loss fans let Baldor™ products run dependably cooler and longer. Their formula, like ours, is simple—quality products and exceptional after-sales support. 100% cast iron construction A true industrial-grade air compressor like our TRI-MAX™ models feature 100% cast-iron construction on the pump, block and heads. An air compressor pump is just like a car engine and, as you know, almost all car engines are made from cast iron. Cast iron is the most durable material when utilized on a high-use, high-temperature applications. Racecar engines may use aluminum for weight reduction, but these engines last only a few races before they must be rebuilt. True copper piping Back to basic chemistry: when compressed air heats and then rapidly cools, you get condensation. The harder you work your compressor, the warmer it will become and the more moisture you'll have, resulting in a couple unfavorable conditions. Moisture that goes through the airlines will eventually go to your air tools. And wet air that accumulates in the bottom of the tank causes excessive rusting and jeopardizes the integrity of your tank. Clearly, moisture is one of your compressor's worst enemies. The solution? Keep the air cool so that condensation never shows up in the first place. That's why all our TRI-MAX™ units employ copper pipe. It dissipates the heat and resists rust like a champ. ASME approved tank All TRI-MAX™ extreme-duty compressors feature an 80-gallon tank by Manchester Tank, the world's premier manufacturer of pressure vessels. Founded in 1946, Manchester Tank produces quality pressure vessels in North America and Australia. Manchester Tank continues to set the standard for quality and reliability and provides unsurpassed value in both mass-market and customized D.O.T. and A.S.M.E. products. Pressure control The pressure switch automatically maintains the set pressure at the control discharge. 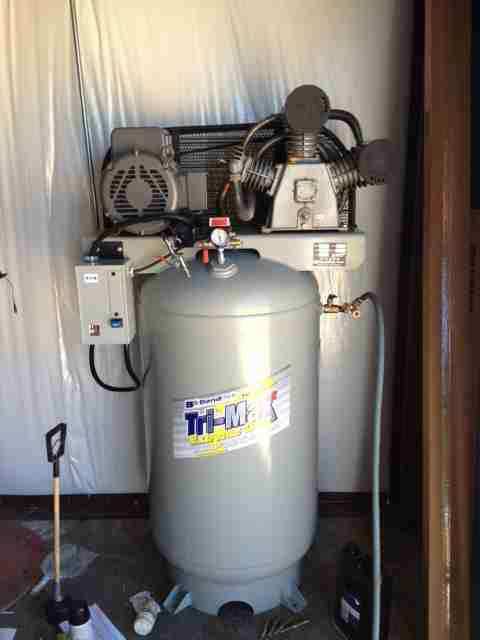 A drop in system pressure closes the pressure switch and kick-starts the air compressor. When the pressure switch is satisfied, it will stop and the unloader valve exhausts the air between the compressor and the check valve. This allows the compressor to begin its next cycle without any head pressure. The pressure gauge allows the installer to see the start / stop pressure settings and to adjust as necessary. In the event of a closed air line or excessive pressure buildup in the compressor discharge, the safety valve in the line protects the compressor from any and all potential damage. Lower revolutions per minute The main advantage of belt-drive compressors is that the pump can spin considerably slower than the motor, increasing efficiency and reducing wear and tear. Pumps on direct-drive compressors turn much faster because the pump is connected directly to the motor shaft and maintains a speed equal to the motor. Most electrical motors spin at a ridiculous 2,850 or 3,450 rpm. Our TRI-MAX™ models use a belt-drive so the pump can run at a lower rate. It might seem backwards, but this is one case where you definitely want a slower pump. The rpm of the motor is consistently the same and cannot be changed. The listed rpm of an air compressor always refers to the pump, not the motor. Rotations per minute is not the most important factor when choosing a compressor—it's cubic feet of air pumped per minute, which is determined by piston size more than rpm. Between several compressors that are all pumping at 900 rpm, the one with the largest pistons will always win. Big chain store air compressors usually try to disguise their higher revolutions per minute as a feature because their pumps are so much smaller. But you won't be fooled; higher rpm translates directly to more heat with no guarantee of better performance.  "I have purchased numerous items from ASE recently for our garage, including the 7.5 HP compressor by BendPak. So far it works great and really provides plenty of air for anything I need. I'm glad I found you."